While no renovation adds as much equity to your home or is likely to be more enjoyed, kitchen remodel costs can get out of control quickly. 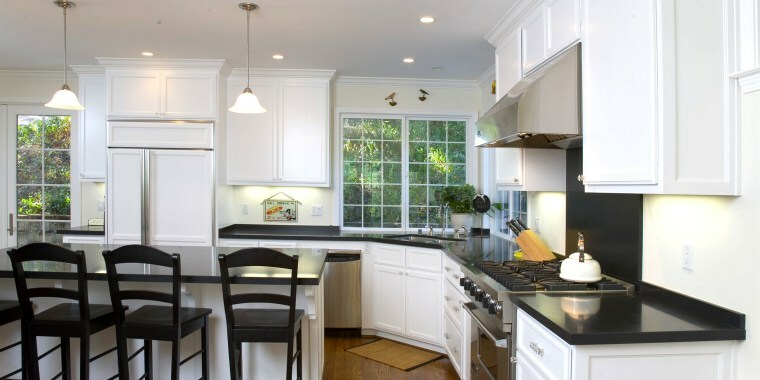 When it comes to remodeling your kitchen, check out where experts suggest splurging — and where you can cut some corners. “When remodeling a kitchen, the number one splurge you should make is countertops. They’re the first thing people see,” said contractor John DeSilvia, host of DIY Network's "Under Construction" and "10 Grand in Your Hand." Karen Williams, a designer and kitchen specialist and principal of the boutique design studio St. Charles of New York, agrees. “Exotic surfaces make a big first impression and can set the tone of the space,” she said. A kitchen island, in particular, deserves the splurge. As the gathering and entertaining hub in most kitchens, it’s highly visible and utilized. So top it with something special — calacatta marble, quartz or gorgeous lava stone, for example — and cut back on out-of-the-way prep areas if your budget is limited. Although there’s definitely a case to be made for investing in the best cabinets you can afford — they consume more than 75 percent of your kitchen space, after all — the savings potential is just too great to ignore. Custom cabinets for a standard-sized kitchen can cost upwards of $40,000, whereas ready-to-assemble cabinets from IKEA look amazing for a fraction of the price, says DeSilvia. That’s a savings of $36,000. Willing to split the difference? Add custom doors and side panels to basic IKEA cabinet boxes, suggests Amy Shakespeare, owner of the New York City-based firm Redtop Architects, or add flair with Panyl panels, an affordable way to give your cabinets a one-of-a-kind look. It’s not necessary to break the bank on a top-of-the-line stainless steel (still the standard), or on brands like SubZero or Wolf. Williams points out that you’re not compromising a well-designed kitchen if you opt for perfectly excellent mid- and upper-range brands like Bosch, GE, Jenn Air and Fisher & Paykel. Just don’t be tempted by bells and whistles, which add unnecessary cost. “Very few people need all the features," said Williams. "The best isn’t the best if it doesn’t serve your needs." Engineered cork and real linoleum tile are sustainable, stylish and soft — something to consider if you cook (it’s more comfortable to stand on) or are a dropper (concrete and hard tile damage easily), says Shakespeare. If you’re willing to spend a bit more, she recommends either reclaimed wood or solid cork tiles (“gorgeous when installed in a herringbone pattern”). If you’re going all in on a renovation, budget generously for windows as nothing adds warmth and beauty to a room like natural light. When Faith Durand, executive editor of the Kitchn.com, recently made over her own kitchen, she put her money in high-quality awning windows with good hardware and full-length sidelights next to a sliding door. Although the kitchen sink sees tons of action, it’s not necessary to spend a lot, especially if it’s an undermount. Williams points out that there are many perfectly good stainless steel basins available for $200-$500. Do, however, spring for a faucet you love — especially a pull-out model that makes washing dishes infinitely easier. “A quality faucet is worth the investment,” she said. Is an extra sink necessary? Nope, that’s what makes it a splurge. According to Shane Inman, Houzz contributor and president and senior principal interior designer of The Inman Company, a second sink can be just as useful as a primary sink because it allows two users to cook and clean simultaneously. While the classic second sink spot is in the kitchen island, having one in a wet bar or pantry closet would feel mighty decadent, too. You know what stinks? A home full of pungent food odors. “Sometimes home owners will try and save money by not running a direct vent from the hood exhaust to the outside,” said DeSilvia, adding that many settle instead for a filtering, ductless model that re-circulates air back into the home. It's not ideal. If you have the space for a vented hood, always spend the extra money. If your home can’t accommodate a direct vent (they’re big and not everyone has an exit point), buy the best unvented one you can within your budget. “Good ventilation is important, especially if you’re not a good cook,” she said. Considering picking up store-bought inserts and fitting them into your cabinetry, says Williams. Pull-out drawers and organizers, cutlery trays, under-shelf racks and other affordable, easy-to-customize items can all be snapped up from The Container Store, Crate & Barrel, Bed Bath & Beyond, Williams-Sonoma and Häfele. Best of all, as your needs change, so can your accessories. Dazzling, dangling fixtures are passionately adored. Under-mounted lights usually generate less ardor. So which should you splurge on? The latter. According to Williams, task lighting — specifically those workhorses that illuminate counter-prep areas — is essential because you use it every day. And since it requires serious electrical work, it’s not as easy to add later. “Overdesigning leads to overspending, running up the budget without any payoff,” Williams points out. Ornate crown moldings, for example, can be composed of five or more pieces, and the more levels of detail, the greater the expense. To keep costs down, stick to ones with only one or two pieces. Along the same lines, opt for wood brackets instead of fancy carved corbels and finished end panels instead of pilasters on islands and cabinets. This article was originally published on June 5, 2014 on TODAY.com.